Importance of internet connectivity can be well ascertained by the wide range of applications that a business of any size (medium or small) utilizes on a daily basis. Regardless of whether, it is processing plastic card transactions, meeting customer queries through round the clock customer support, making use of cloud computing, or just engaging employees for online work at different levels, the efficiency with which these tasks can be completed matters. And this is where the “need for speed” metaphor comes into play. How will you test the existing speed? If you think that you are not getting the desired service or speed from your Internet Service Provider, you could go through the monthly bill once and find out how much you are paying for the Mbps or Megabits per second. This is also referred to as the Internet speed. Find out how well your present connection is working. Remember, your activity on the internet does not eat up bandwidth alone, but it is also the number of connections using up the internet speed at any given point of time. So, find out which employees are using the internet and for what purpose. Browsing and mail- If you have a small set up at home where you are required to download few files once in a while, send and receive emails, and browse websites relevant to your business, not much bandwidth is required. Also, if there are not too many devices connected at the same time, approximately 2Mbps should suffice. As such, you can opt for an internet plan that should meet the basic internet activities. Video streaming- Unless you have several devices connected at once, just for video and audio streaming, you will not require a very high speed internet connection, if however, the videos you watch are of HD quality, you might need extra bandwidth, otherwise just for the above mentioned activities (audio and video streaming without multiple devices), you might require not more than 3Mbps. Editing videos – If your business includes that of video editing, downloading huge video files and uploading the same or engaging in any programming assignments, you will perhaps need not more than 12Mbps. However, take into account whether or not other devices are connected simultaneously or not. 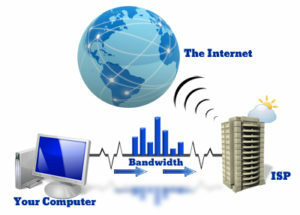 Depending on how much bandwidth your business requires, you can sign up for the internet connectivity plans that are offered by ISP. 155/15 Mbps –For streaming videos, video conferencing, and cloud based applications when around 10 to 14 devices are connected at any point of time. 330/20 Mbps – when number of devices connected is between 12 and 16 and for bulk document backup in cloud and hosted websites (multiple).